This morning I found Yiorgos (George) Haridimou in his auto repair shop barbecuing two huge skewers of pork with friends and customers. George is an avid supporter of the Athens-based AEK soccer team. He’s a president of the AEK Fan Club of USA and was proudly wearing one of its sweatshirts when I spoke with him (he’s third from the right in the photo). 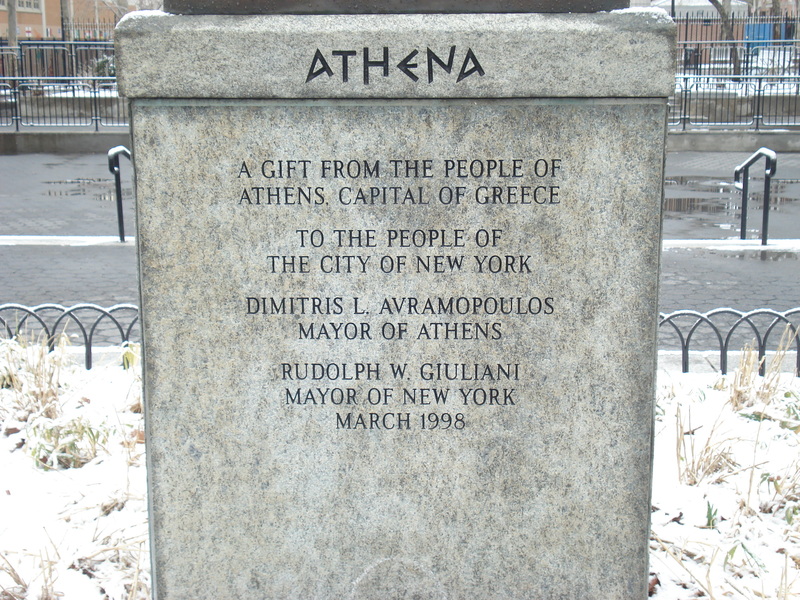 He moved with his family from Cyprus to New York in 1982, growing up first for a few years in Yonkers before moving to Astoria. 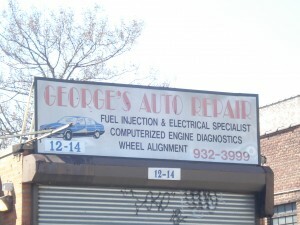 He wanted to be a mechanic since he was a boy. 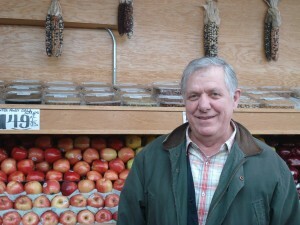 He started the business 25 years ago, and bought his building on 30th Ave near 12th Street in 1998. 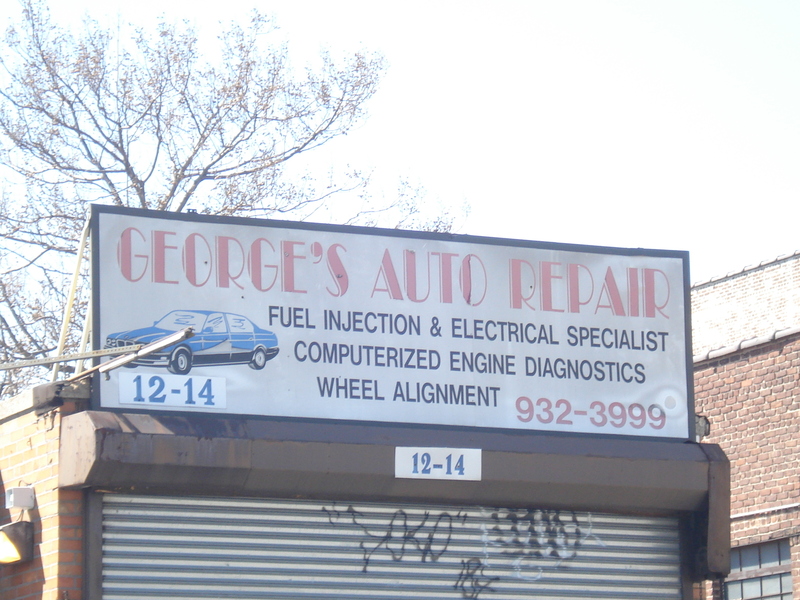 “I set up the business here because the zoning laws allowed you to start up an auto-repair shop,” George says. “It was more industrial. Now it’s starting to become more residential. “That’s a good thing. The neighborhood is much better than it was before, even than 10 years ago. There used to be a lot of crime. It wasn’t the nicest part of town. 21st Street was like the boundary, with the bad area on this side of it. Khaled Shallah is from Arwad, Syria’s only inhabited island. He trained and worked for many years as a boat mechanic. His work on container ships took him to “all the places you can imagine,” he says, from South America, to Europe, to Asia, to Africa. The boats he worked on carried all kinds of things. One had a shipment of live lambs from Romania. Khaled says that he enjoyed life at sea, being far away, and close to nature, and beginning to feel like wherever he was, was home. But eighteen years ago he came to settle in the US. He started a new life from scratch. 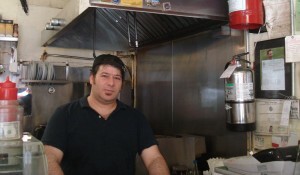 He worked at a cousin’s restaurant in Manhattan and for a while in another restaurant in Texas. Back in New York, eight years ago he set up Pita Hot on 30th Ave.
Pita Hot’s small space is filled with the sound of sizzling on the grill. The walls are densely decorated with postcards, calendars and ornaments from the Middle East. Customers take their food out or eat it at one of the small café tables. For each waiting customer, Khaled or one of his co-workers dunks a small piece of pita into a jar of hummus on the front counter – a Pita Hot signature gesture. Despite feeling completely at home in Astoria, Khaled says that in an ideal world he would have brought his kids up for the first years of their lives in Syria, moving with them to the US when they were a bit older. In the US they go to school too young, he says. They go young, but while there they learn much less than if they spent that time with family and friends during their early years. 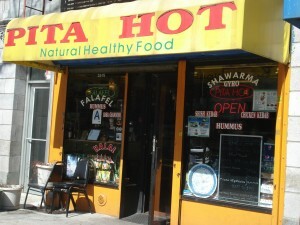 Natalia Paruz has lived just off 30th Ave since 1998, and in Astoria for longer than that. “My name is Natalia Paruz, but everybody calls me the Saw Lady because I play the musical saw. 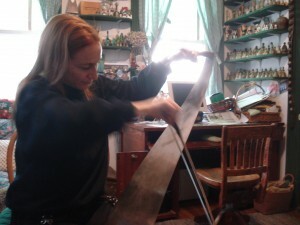 The saw has a very angelic sound. A lot of people say that it reminds them of the sound of an opera singer. I like it because the sound is so ethereal and spiritual. I also like the visual. Not only the fact it is a saw, which is kind of jarring because people don’t think that a saw would make such a beautiful sound. But also because when you play a saw the entire instrument moves in the air and makes a sort of wave shape. Natalia had found what that she wanted to do. Previously she was a professional dancer, but her dancing career was cut short when she was hit by a taxi in New York. She had been at a loss as to what to do, until she saw the saw player. “I went backstage to ask if he would give me a lesson. He said no. So I was forced to be self-taught. That turned out to be a very good thing because I can say that I did it all on my own. I came back here to Astoria and I borrowed a saw from somebody who had been using it for woodwork. I discovered how to make a sound with it. But it could only make six notes because it was an old and rusty saw. So I went to the hardware store that used to be on Broadway and 44th Street, and bought a new saw. Sure enough, the new saw had no rust on it so I was able to get a whole octave of notes. Throughout the years I have collected more and more saws in my quest for the ultimate-sounding saw. Finally I got the one I use now, which was made in France. It’s quite long, 32 inches, which means it has about three and a half octaves altogether. I moved to Astoria because my boyfriend Scott – now my husband – lived here. When I first moved in with him I didn’t know anybody beside Scott. At first I felt kind of lonesome because most of my friends were in Manhattan. Then I picked up a local newspaper that was given out for free in banks. I opened it and realized there were all these events taking place in Astoria. 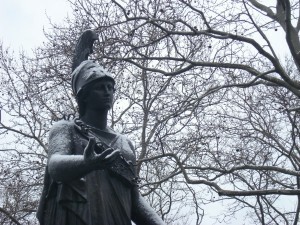 I went to an event organized by the Greater Astoria Historical Society. All of a sudden I started meeting people and had friends. I fell in love with Astoria because it feels so much like a small village where everybody knows everybody. Now I have so many friends here that I hardly ever bother going into Manhattan any more, except for my busking. I once tried busking in a subway station in Queens. But I was approached by the police almost immediately and was told that I can’t do that. So the police are not as nice to buskers here as they are in Manhattan. I know another busker who tried busking at the Steinway Street subway station. It just so happened that at the same time there was a murder right there. That sort of put people off wanting to play at that station. It was just a coincidence. It’s not like people get killed here all the time. Busking on the New York subway is so much fun that it’s addictive. The people, the proximity of the people is intoxicating. I get so much energy from all the people who come to talk to me. If I play on a stage, I’m up there in the lights and the audience is down there in the dark and I don’t really get to see their faces and their reactions. So it kind of feels isolated for me as a musician. On the subway I see the transformation on people’s faces as they are watching me, listening to me. And they come to talk to me, to ask me questions, or tell me about themselves. There’s this exchange of energy. It’s as if the music is the impetus for communication. Sometimes I might be playing in the subway and someone who’s a little scary-looking might be approaching me. I will think oh no, he might be trouble, perhaps he’s going to steal from me. And 99.9% of the time the scariest looking people end up being the nicest, kindest people. Playing in the subway really taught me not to judge people by first appearances. There are so many encounters every day on the subway. I put them on my subway music blog. If I was to describe just one really striking encounter it’s this one. I was playing at Times Squares subway station, and there were a bunch of people around me. On one side of me was a blind man. He had a cane and you knew from his face that he couldn’t see anything. He was listening to the music. His face transformed into a big smile and you could really see that he was enjoying himself. On the other side there was a lady, who had nothing to do with the blind man. She noticed how he was enjoying the music. She came to me. She bought my CD. She went over to the blind man and she put the CD in his hand and she said to him, ‘this is the music that you’re listening to right now.’ That was so incredible. The lady didn’t know him or owe him anything. She did this act of kindness to a total stranger. I was born in Israel, though as a child we traveled a lot. My mother was a concert pianist who gave a lot of concerts in Europe. And my father was a research scientist, so he had to do research in different universities around the world. We lived in different countries for a year here, two years there. As a concert pianist, at first my mother kind of frowned upon my playing a saw. She especially frowned upon the fact I was teaching myself. She thought that you can’t just learn music by yourself. You have to go to a proper school. One day her agent was coming over to our house to work with her. I asked my mother if she would mind if I played for the agent. She reluctantly agreed, because she was so sure that he wasn’t going to like it. I played for him and he LOVED it! Right away he said ‘oh, we must incorporate you into your mother’s concert.’ He was so enthusiastic about my playing and that changed her approach. I was a part of one of her concerts and the audience just went wild. 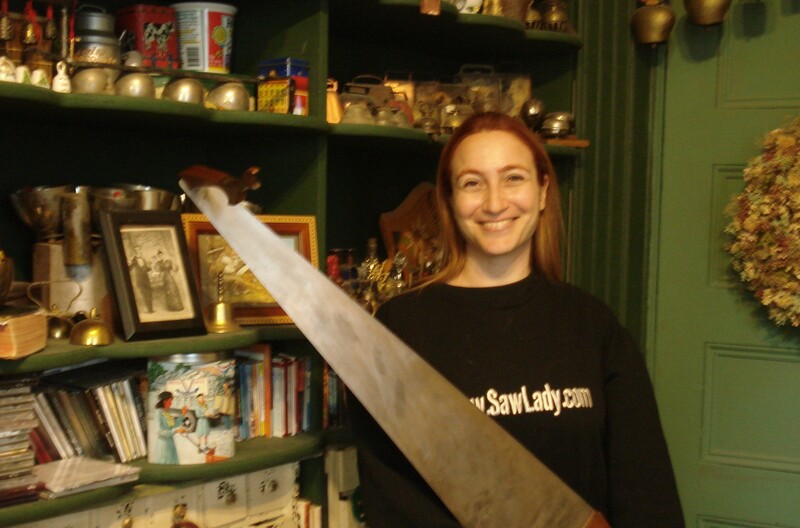 Nine years ago I started the Musical Saw Festival in Astoria. When I started it there were four other saw players beside myself, and three people in the audience. The festival has grown over the years to include 55 saw players and more than 400 people in the audience. 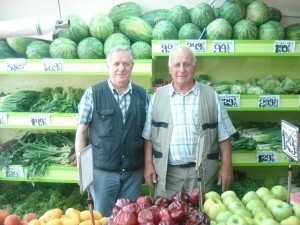 A huge part of the growing factor is the local community. All the neighbors come. When the time comes in July you’ll see my flyers everywhere – all the store owners around 30th Avenue agree to put the flyer in their front window. Round the time of the festival last year I went to the Key Foods supermarket and the cashier was asking me, “so how many saw players do you have this year?” Everybody is enthusiastic about it in the neighborhood, which means a lot to me. The saw is my main instrument but I also play the bells. They’re a lot more difficult to carry! I play a set of 65 pitched cow bells. I lay them on an eight-foot long table and there’s a special foam that goes on top of the table. I play mostly ragtime music on those bells. They have a very happy sound that lends itself very nicely to ragtime. And I play a set of English handbells, which belong to Trinity Lutheran Church here in Astoria. I play those as a soloist and also with their group. And LISTEN to Natalia playing Amazing Grace on her saw (with the sound of me taking this photo and my little son Jack chiming a bell in the background). Bobby Kartsagoulis helped to set up Eliniki Agora Fruit and Vegetable (otherwise known as the 30th Avenue Fruit Market) in 1972. 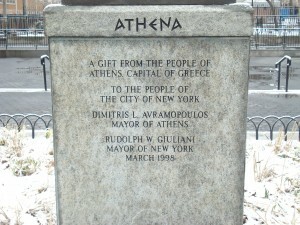 He had moved to the USA from Greece in 1963, living first in Canada before he moved to New York. 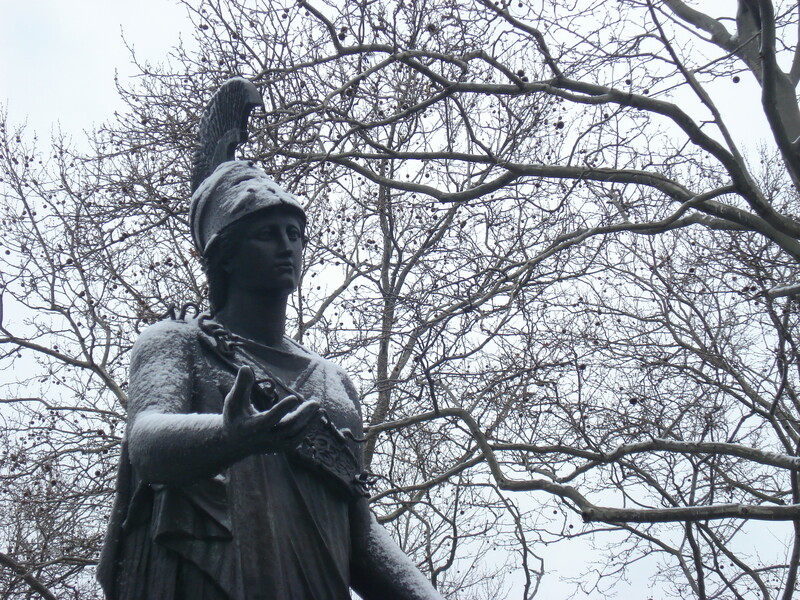 He says the Greek community in Astoria may be getting a bit smaller but it is still strong. Many of the people he knew when he first moved to Astoria still live here. The neighborhood has “changed too much,” he says. “When I arrived most people were Greek and Italian. 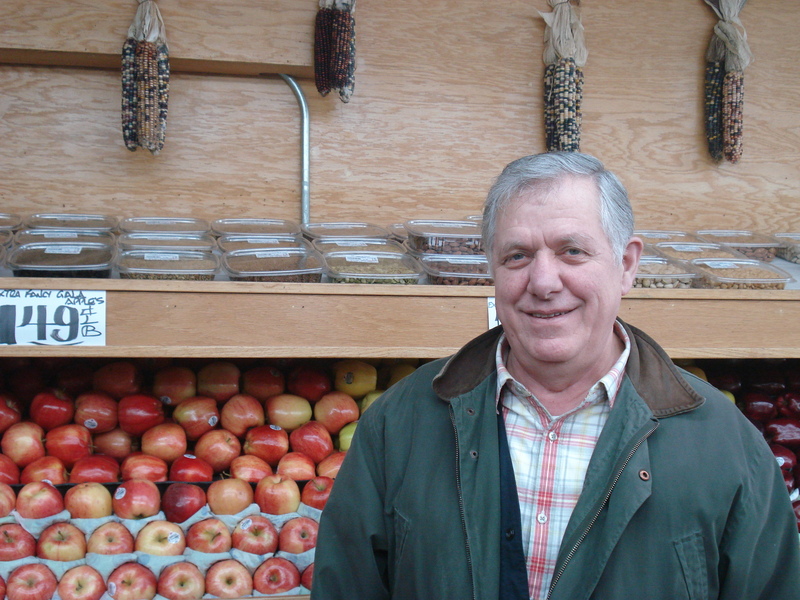 Now there are people from all over.” He says he continues to enjoy Astoria for its cafés, and the fact that you can easily find Greek food products.